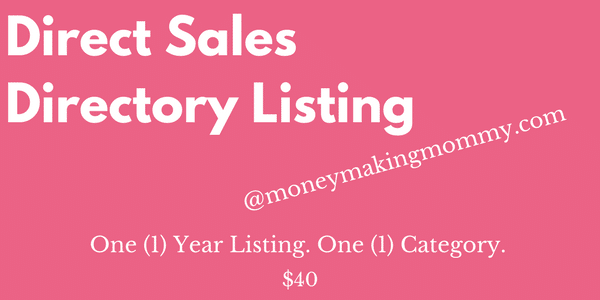 Yes, I want my listing in the MoneyMakingMommy direct sales directory! 1. Make your listing for your company as original as possible. Copying and pasting from the company website are not only liable, it will not help your listing rank in the search engine pages. We do not allow duplicate content. 2. Be as detailed as possible. People are coming to your page interested in your company and you. Try to include information about why you chose the company, your success with the company, your life working at home. Vague and skimpy pages are unappealing and visitors typically leave the page to find more information somewhere else if it's not provided. 3. I am happy to add up to two more images. These can be of you, the products…. a home party you did…. your first commission check (just ideas) – so feel free to let me know you want to add more in the comments area and I will contact you. ** Be aware: You MUST have permission or rights to use the images you're using. If you do not — do NOT submit them. People are being sued for thousands of dollars for using images without permission. 4. This listing is a reflection of YOU and the company. Be bold, fun and informative!! People want info – not some cookie cutter info that they can get on the company's corporate website. All payments are made via PayPal.com. You do not need to have a PayPal account in order to make payment. PayPal accepts all major credit cards and eCheck payments.